Cinco de Mayo is upon us, and of course that means it’s time for a margarita or three. 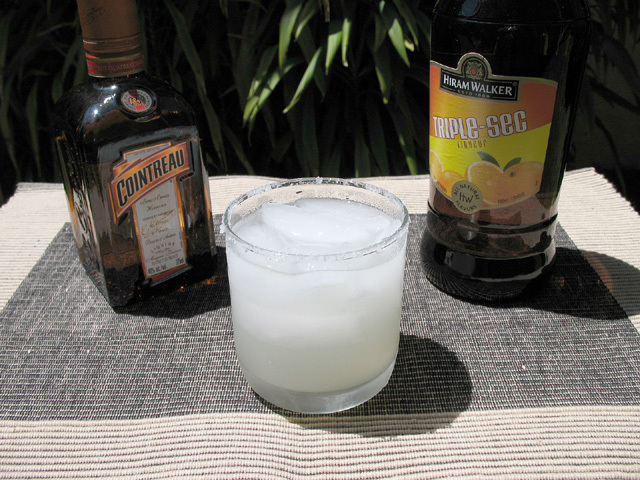 In addition to tequila and freshly-squeezed lime juice, cocktail enthusiasts will likely be reaching for Cointreau to mix in their margaritas. But these days, people are trying to save money wherever they can. So is it possible to use less expensive ingredients and still make a great cocktail? 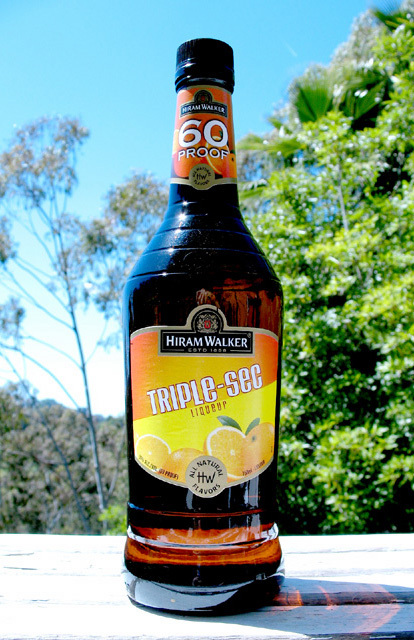 The folks at Hiram Walker think so, and they sent a bottle of their triple sec and asked me to match it against Cointreau, the heavyweight champ of orange liqueurs, in a Triple Sec Challenge. For the taste test, Hiram Walker sent a bottle of Cointreau as well. To help me with the triple sec throwdown, I was joined by my good friend and fellow imbiber Scot (aka The Red Bearded Hipster). For the Triple Sec Challenge, we mixed margaritas using a Jim Meehan recipe from the 2009 edition of Food & Wine Cocktails. Moisten the outer rim of a rocks glass with the lime wedge, and coat lightly with salt. Add all of the remaining ingredients and shake well. Fill the rocks glass with ice and strain the drink into the glass. Note: for the taste test, we omitted the salt on the glass rim. We prepared two margaritas, one with Cointreau and one with the Hiram Walker. To identify which was which, we put a sticker at the bottom of each glass. Then came the taste test, and we took turns sipping from each margarita. Initially, there wasn’t an obvious difference between the two drinks. Then, after a couple more tastes, one of the margaritas emerged as our consensus pick. Checking the bottom of the glass, our choice was the margarita made with Cointreau. To put the results in a different perspective, BevMo prices its 750ML bottle of Cointreau at $33.99, while a 750ML bottle of Hiram Walker is just $7.99. If you’re mixing pitchers of margaritas for a party, or if it’s margarita o’clock every night (like it is for some people I know), Hiram Walker may very well become your go-to triple sec. Don’t worry, I won’t tell anyone. Nose – Strong, pungent orange; slightly bitter orange peel. Taste – Sweet orange, citrus. Finish – Orange, tart and sweet. For more information, visit www.hiramwalker.com.